The floral designer behind this epic garland of bay leaves, Emily Thompson shares arrangements that embody all the styles you can browse in our Registry. 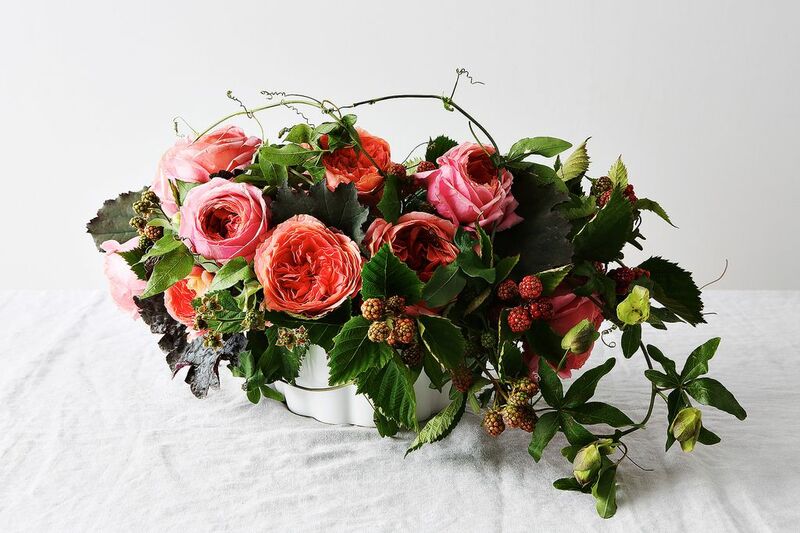 Nestled in a fluted baking dish, a berry and rose arrangement is timeless and everyday. For a classic centerpiece, what could be more rich with associations and history than a rose—particularly a giant, ginger pink, fragrant beauty such as Romantic Antike? I love to pair roses with raspberries and blackberries, perhaps because the plants are in the same family, and are such natural companions. These richly colored blooms are more than a little wild, the way they spill out of an enamel pitcher. 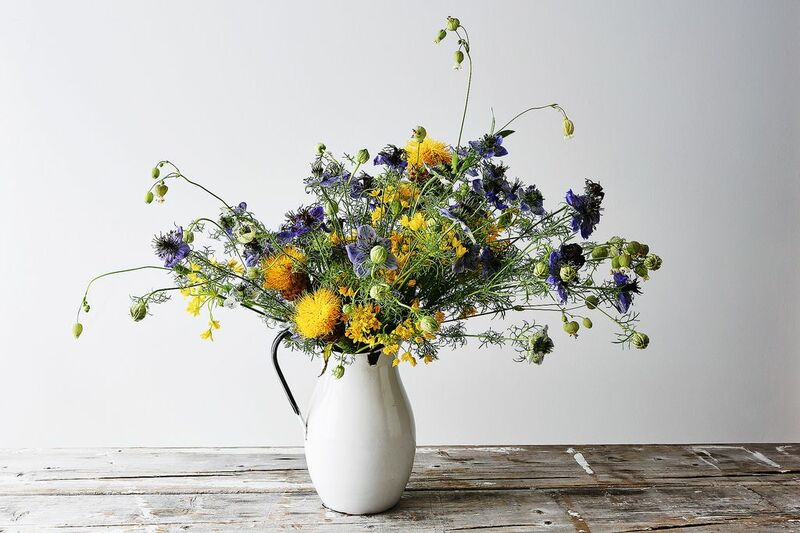 This "just gathered from the meadow" sensibility is a casual arrangement that celebrates weedy wildflowers in complementary blue and yellow tones. It's meant to mimic a rolling prairie. Don't have a vase? Prop flowers up on a scalloped edge cake stand using flower frogs. To me, nothing is more decadent than this rich tumult of clematis. The luxury of this arrangement, beyond the sumptuous materials, lies in its extreme delicacy. Each stem is placed precisely, and certainly cannot travel, so must be constructed "in situ." 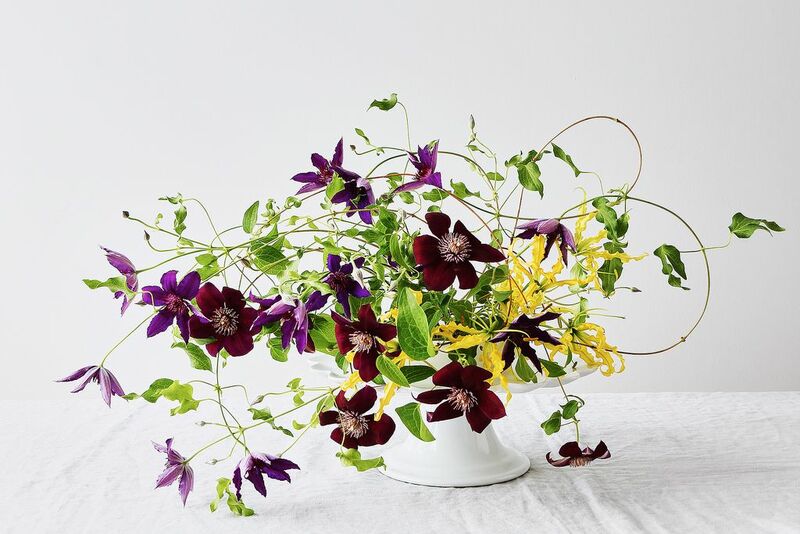 The gloriosa lily brings out the velvety violets of the clematis, almost backlighting the arrangement. Glass decanters make excellent vases, especially when they're as geometric as this handblown one. This lovely decanter needs very little. I chose distinctive materials whose textures speak to one another: The single, bold artichoke sits in a collar of spidery ferns, both forms a bit prehistoric. Not every vase needs to be porcelain or glass—as seen by this slender, mossy green one that highlights the color of the stems. Watermelon and avocado green hues are paired here in a kitschy, vibrant, almost humorous design. These extraordinary poppies, so bright they are almost lit from within, rest on exotic buddha's hand citrus. Punchy persimmons float like a swarm of bees, and the grevillea stalks sproing out like sparklers. 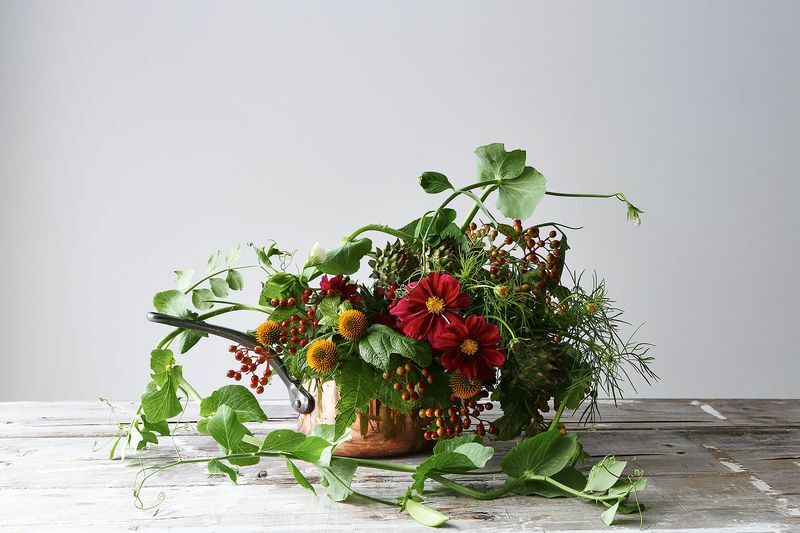 Copper pots have so many uses in the kitchen, not least of which is as a way to display flowers. For a rustic design, I love to add lots of edibles to the pot. These beautiful copper pans double as elegant vases. This design is meant to evoke an old stone farmhouse in Provence, where wild game cooks on a spit nearby. 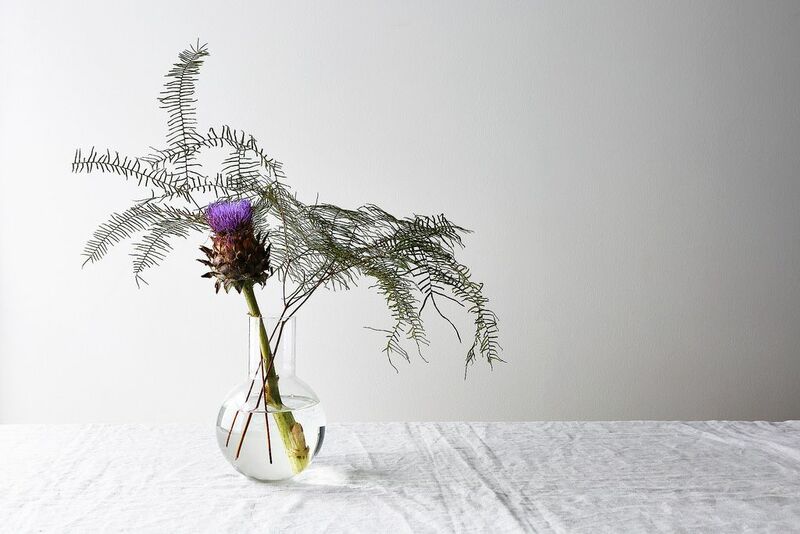 Emily Thompson, a sculptor-turned-florist, champions wild, unruly materials from the forest and the field, working them into sometimes grand and sometimes austere compositions. Her designs strive to bring depth to their settings, balancing classical design with contemporary sensibilities. 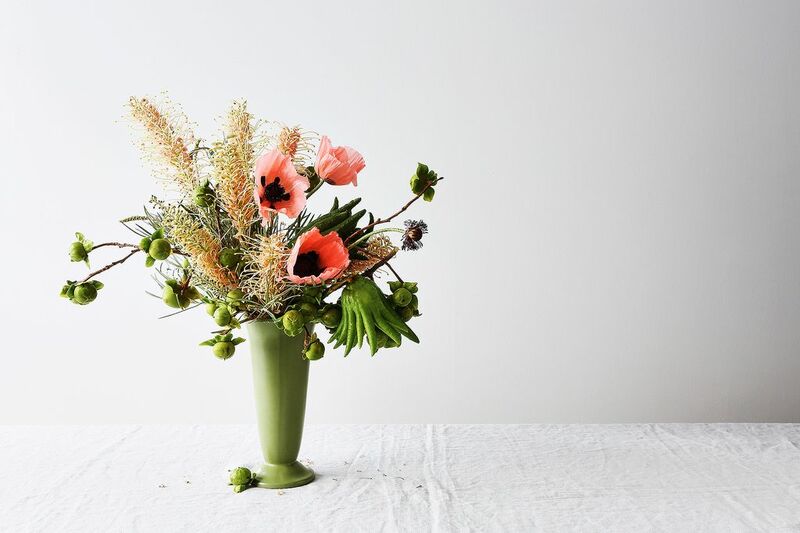 For Emily, flowers are the infinitely varied medium for her sculptural installations. Each wedding Emily designs is quite different from the next, as every couple offers a new collaboration. Emily believes no gesture should be lost, and no matter the grandeur or complexity of the design, it should feel effortless. Emily's selections from Food52's Shop reflect her love of beautiful materials-- marble, copper and brass, as well as many different cutting implements, as her work involves inordinate hours of slicing, chopping, peeling, lopping and clipping, much like a chef (she is a very enthusiastic home cook, herself). There are a few objects chosen for beauty over utility-- glass and brass drinking straws, for instance. I am always amazed at how talented some people are. What someone can do with flowers is amazing. I love these...now if only I could make my arrangements look as good!